I found this recipe and decided to give it a try. It is very fast to whip up, and is super nutritious. I think these would be great for those on the go in the mornings that don’t have time for a hot breakfast. Grab one on the way to work or for the kids headed to school. This recipe was from LeelaLicious. So bake them and wrap individual and freeze, grab one the night before and let it thaw and be ready to go. Preheat over to 350*. Line a baking sheet. In your small bowl or pan warm the coconut oil and honey to just melting the oil. In a larger mixing bowl combine all the dry ingredients, then add in the puree, eggs and oil with honey mixture. Mix till combines really well and all ingredients are moist. Drop each cookie, about 1/4 cup onto the cookie sheet, and flatten them a little, ( they will not spread while baking.) Bake for about 15-20 minutes until edges are lightly browned. Cool and store in airtight container, or wrap individually and freeze. They are really tasty. I use all organic ingredients in my baking just because I love organic. I am going to try making them with applesauce in place of the pumpkin also, I will let you know how that turns out. 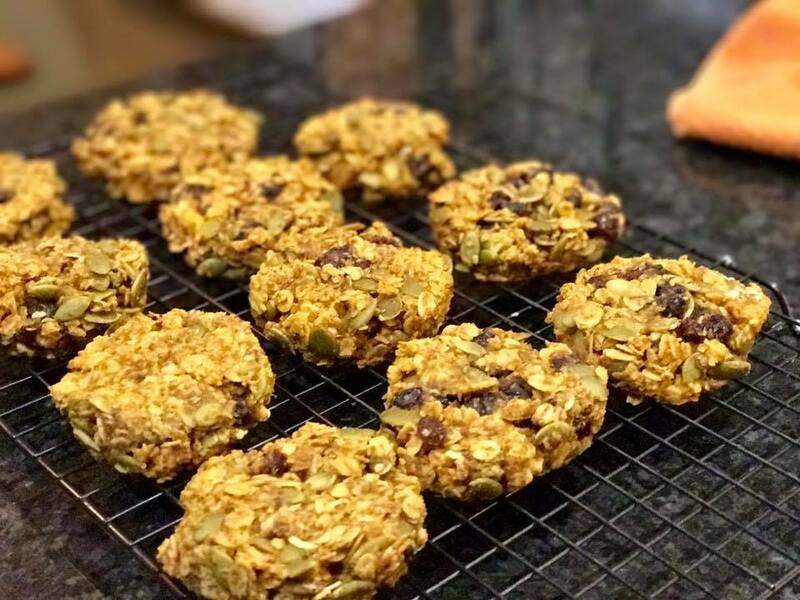 This entry was posted in From the kitchen, Recipes and tagged breakfast, cookies by admin. Bookmark the permalink.